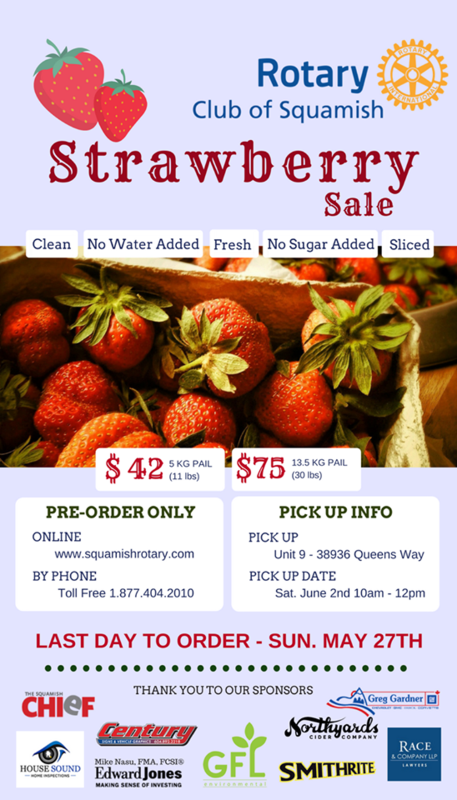 You may pick up your strawberries on Saturday Jun 2. More information on the poster at right, the Rotary Club of Squamish web site or the Rotary Club of Squamish Facebook page. You're in luck. Special arrangements will be made for District Conference attendees to pick up their strawberries. Well why not? First we ask you to reconsider as it will be a great conference and we would really like to see you there. Click here to register for the conference. Still not attending? You can still order strawberries. Click here to place your strawberry order.